Our new series, On the Minds of Investors, draws on the depth and breadth of our market and economic expertise to respond to the questions that matter to our clients. Focused on the big themes driving markets today, the series includes written analysis, as well as video and other multimedia experiences. In this article, Karen Ward, Chief Market Strategist for EMEA, gives her opinion on the Brexit negotiations. We believe the Brexit negotiations will conclude with a relatively “soft” Brexit. The Prime Minister’s initial wish list essentially tried to please everyone. But the EU rejected that list, and compromises still need to be made—on both sides—before the deal can finally be sealed. To understand those concessions that still need to be made, let’s recap on what the UK actually wants from Brexit. This in itself isn’t entirely straightforward because the nation, parliament, and the Conservative government is divided over what we should be seeking to achieve. As a result, the Prime Minister’s initial wish list essentially tried to please everyone. The UK wanted to leave the European Union (EU), but it didn’t want a border on the island of Ireland. It still wanted goods, services and capital to flow freely, but it wanted the power to control immigration. The UK wanted British rules set by British courts, and it wanted to stop sending “substantial” sums to the EU. And finally, the UK wanted to be able to trade more freely with other parts of the world. This wish list was unacceptable to the EU. EU negotiators understandably argued that without a border on the island of Ireland, then they could not guarantee that goods travelling into the UK would stay out of the EU. And if the UK establishes its own rules, that could give it a competitive advantage over companies in the EU. So the UK will have to prioritise and accept a series of concessions. In fact, that process is under way. The “Chequers” agreement—reached by the UK government—has prioritised the Irish border. Not having a physical border requires a customs agreement in goods. The Prime Minister has already conceded that this would require the UK to abide by the EU rules set for goods. It may also mean the UK is more limited in its ability to strike trade deals with the rest of the world. The next priority for the Prime Minister is likely to be some control of migration. I believe there is compromise to be reached here if the UK agrees that any EU resident can come from the EU to work if they have a pre-agreed job. In my mind, this would be acceptable to the UK population, but would also not defy the EU’s principles. The UK has conceded that without full access to the single market, this will limit its ability to trade in services. But ultimately it seems likely that there will be an agreement on regulatory co-operation that will largely preserve the UK’s dominance in the provision of financial services. Many commercial banks have indicated that if forced to move they would focus relocation efforts on the city of Frankfurt to be close to the regulator. Given the strength of the German economy, it isn’t obvious why Chancellor Merkel would find such a relocation desirable, particularly given the inherent risks that come with a large financial system. It is in the interests of both sides to make compromises towards a deal, and there would be economic pain on both sides of the Channel if one cannot be struck. It would certainly be most keenly felt in the UK given that 8% of UK GDP is exported to the remaining EU states. But 3% of EU GDP is exported to the UK and supply chains are highly integrated. Given the fragility of the eurozone recovery, such a shock could be enough to halt the recovery in both regions. Once the UK and EU negotiators agree on a deal, it then needs to be ratified in the parliaments of the UK and all 27 EU member states. This is why the negotiations need to conclude in the coming weeks to allow time for the legal processes that follow before the final deadline of March 2019. There is considerable scepticism that the UK Prime Minster will receive support from enough members of her party to pass the Withdrawal Bill in UK parliament. While it is true that a deal like the one above will not please all members of the Conservative Party, it is worth remembering the consequences of blocking the bill. The resulting political deadlock could only be resolved in one of two ways: another referendum on the EU (which could result in no Brexit at all), or a general election, in which the Conservatives could lose office. Both seem a significant risk to take and ultimately I believe will ensure that the Prime Minister has enough support from her party to pass the Withdrawal Bill. There will then be a period of transition between March 2019 when the UK formally leaves the EU and December 2020, which will allow businesses time to adapt to the new framework. 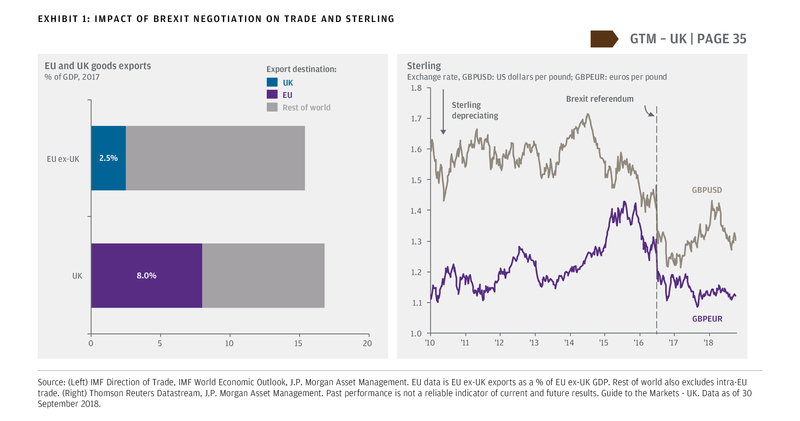 If this analysis proves correct and the negotiations conclude with a relatively soft Brexit, there are likely to be significant implications for the UK economy and markets going into 2019. We believe there is still a significant Brexit risk premium in UK rates, currency, and equity markets. As a result, a satisfactory resolution would likely see sterling rise, which would bring down UK inflation and help lift consumer and business spending. We may then see a significant re-pricing of expectations for UK interest rates. Remember that before the referendum in 2014, the Bank of England (BoE) was expected to be the first central bank to start taking interest rates back to “normal”—ahead of the US Federal Reserve. That’s because unemployment was low and the recovery well advanced. The Market Insights program provides comprehensive data and commentary on global markets without reference to products. Designed as a tool to help clients understand the markets and support investment decision-making, the program explores the implications of current economic data and changing market conditions. For the purposes of MiFID II the JPM Market Insights and Portfolio Insights programmes are marketing communications and are not in scope for any MiFID II/MiFIR requirements specifically related to investment research. Furthermore, the J.P. Morgan Asset Management Market Insights and Portfolio Insights programmes as non independent research have not been prepared in accordance with legal requirements designed to promote the independence of investment research; nor are they subject to any prohibition on dealing ahead of the dissemination of investment research. This document is a general communication being provided for informational purposes only. It is educational in nature and not designed to be as advice or a recommendation for any specific investment product, strategy, plan feature or other purpose in any jurisdiction, nor is it a commitment from J.P. Morgan Asset Management or any of its subsidiaries to participate in any of the transactions mentioned herein. Any examples used are generic, hypothetical and for illustration purposes only. This material does not contain sufficient information to support an investment decision and it should not be relied upon by you in evaluating the merits of investing in any securities or products. In addition, users should make an independent assessment of the legal, regulatory, tax, credit, and accounting implications and determine, together with their own professional advisers, if any investment mentioned herein is believed to be suitable to their personal goals. Investors should ensure that they obtain all available relevant information before making any investment. Any forecasts, figures, opinions or investment techniques and strategies set out are for information purposes only, based on certain assumptions and current market conditions and are subject to change without prior notice. All information presented herein is considered to be accurate at the time of production, but no warranty of accuracy is given and no liability in respect of any error or omission is accepted. It should be noted that investment involves risks, the value of investments and the income from them may fluctuate in accordance with market conditions and taxation agreements and investors may not get back the full amount invested. Both past performance and yields is not a reliable indicator of current and future results. J.P. Morgan Asset Management is the brand for the asset management business of JPMorgan Chase & Co. and its affiliates worldwide. This communication is issued by the following entities: in the United Kingdom by JPMorgan Asset Management (UK) Limited, which is authorized and regulated by the Financial Conduct Authority; in other European jurisdictions by JPMorgan Asset Management (Europe) S.à r.l. ; in Hong Kong by JF Asset Management Limited, or JPMorgan Funds (Asia) Limited, or JPMorgan Asset Management Real Assets (Asia) Limited; in Singapore by JPMorgan Asset Management (Singapore) Limited (Co. Reg. No. 197601586K), or JPMorgan Asset Management Real Assets (Singapore) Pte Ltd (Co. Reg. No. 201120355E); in Taiwan by JPMorgan Asset Management (Taiwan) Limited; in Japan by JPMorgan Asset Management (Japan) Limited which is a member of the Investment Trusts Association, Japan, the Japan Investment Advisers Association, Type II Financial Instruments Firms Association and the Japan Securities Dealers Association and is regulated by the Financial Services Agency (registration number “Kanto Local Finance Bureau (Financial Instruments Firm) No. 330”); in Korea by JPMorgan Asset Management (Korea) Company Limited; in Australia to wholesale clients only as defined in section 761A and 761G of the Corporations Act 2001 (Cth) by JPMorgan Asset Management (Australia) Limited (ABN 55143832080) (AFSL 376919); in Brazil by Banco J.P. Morgan S.A.; in Canada for institutional clients’ use only by JPMorgan Asset Management (Canada) Inc., and in the United States by JPMorgan Distribution Services Inc. and J.P. Morgan Institutional Investments, Inc., both members of FINRA; and J.P. Morgan Investment Management Inc.
Karen Ward, Managing Director, is the Chief Strategist for EMEA for J.P. Morgan Asset Management. She delivers insight into the economy and financial markets to thousands of professional investors across the UK, Europe and globally. Karen has considerable experience in both public policymaking and economic and financial analysis. She started her career at the Bank of England providing supporting analysis for the Monetary Policy Committee. She joined HSBC Global Banking and Markets in 2006 as Chief UK Economist. She was promoted to Senior Global Economist where her work included The World in 2050 - an analysis of the structural changes affecting the global economy and the rise of the emerging economies. Karen was appointed Chief European Economist in 2014. In 2016 she was appointed Chair of the Council of Economic Advisers for the Chancellor of the Exchequer. In this role she advised the Chancellor on macroeconomic issues including fiscal strategy and Brexit. Karen has a Masters with Distinction in Economics from University College London.